Cabin rental reviews are very important to us. Every guest that stays at a vacation rental home managed by My Mountain Cabin Rentals will receive a satisfaction survey / Guest Review email. This gives you the opportunity to review the cabin you stayed in and rate the service you received from our team. Please note: We have hundreds of reviews from guests who have stayed in a property managed by My Mountain Cabin Rentals. Due to a recent upgrade of our website they are not being displayed at this time. We are moving our entire survey system online therefore only new reviews will be shown. Thank you, we appreciate your business and look forward to seeing in Blue Ridge, Georgia very soon! It is a beautiful cabin on a beautiful property with a spectacular view. It has all the amenities you could possible want or need. We had an amazing time and we cannot wait to come back and stay at this property again. 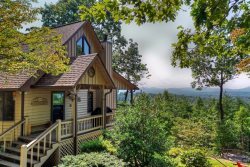 This cabin has it all and is such a wonderful place to relax and enjoy the Blue Ridge Mountains. The view is spectacular and the wrap around deck was one of the most frequently used features of the house. We ate most of our meals outside, enjoying sunrise and sunset on the deck and went out after dark to star gaze and spot lightening bugs. We were struck by how quiet (and dark it is at night). Despite being in a community with homes nearby, we never heard or saw anyone else from the house, really made it feel like our family's personal hideaway. One morning my daughter and I were up early and saw a deer walk right through the yard, it was such a magical way to start the day. We had a family gathering and loved that each couple had their own king bed and bathroom. That's so hard to find, especially at such a reasonable rate. The bed and bedding were very comfortable, even our kids slept well despite the 3 hour time change. We traveled from Oregon and love being outdoors, so we soaked up as much lake and trail time as possible. This was easy to do in Blue Ridge with so many outdoor activities within a 10-30 minute drive. Our favorites included a hike to Fall Creek Falls, a moderately short hike the entire family could do with a beautiful waterfall at the end you can wade in at the base; Swimming at Vogel State Park - they had a lovely sandy beach with shaded areas we could all play in and a nice lake to swim in; horseback riding at Blanche Manor trail riding on the Tennessee border. Blue Ridge is also such a fun town to explore with fantastic food (even compared to Portland cuisine), shops to explore and a beautiful scenic train in the middle of town. Overall My Mountain RendezView was everything we could have asked for in a vacation property. Its clear the owners thought of all the details to make sure their guests have a wonderful stay. Well definitely be coming back.